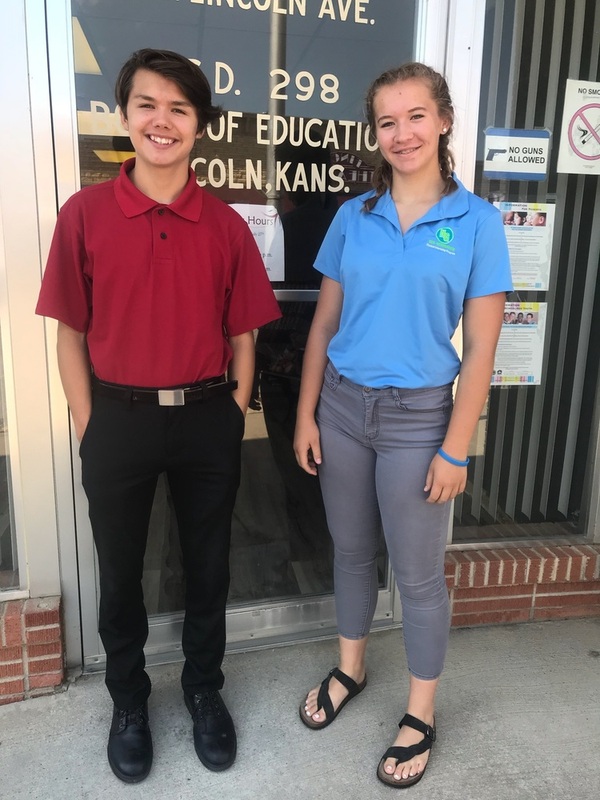 Preston Howard and Carson Walter, two high school students were hired this summer through the Nex-Generation Round-up for Youth, Inc. grant to work at the USD 298 Board Office. This internship allowed assistance with the newly established Paw Print Store, support with the Summer Food Program at Lincoln Elementary School and general help at the board office. The board office has offered this internship during the summer for the past three years. This year two interns were hired to fill this vacancy to cover the large variety of jobs needing to be done. Carson and Preston worked on different projects throughout the summer. Carson assisted more on the office side of things: collecting and sending mail, creating and distributing flyers, copying enrollment papers and making packets to mail out and checking in supplies for the upcoming school year. Preston started off the summer preparing the Paw Print store to be opened at the end of June. He painted the store, built the clothing racks, and took inventory of the clothes. The grand opening of the store was on June 25, 2018. Preston helped with the summer food program at Lincoln Elementary School. He also contributed in the office by checking in packages, answering phone calls and shredding old documents. Preston and Carson first heard of the internship at the Fort Hays Career Expo last school year. The application period opened in March. They both submitted a cover letter, a resume and were interviewed. “Carson and Preston were a wonderful addition to the board office this summer. They brought with them daily an eagerness to assist with anything asked of them and contributed a youthful sense of humor at a horribly busy time of year. The workload that descends annually in summer months in the form of mountains of paper work, closing out the fiscal year; creating the budget for the upcoming year, state reports, ordering teacher supplies in anticipation of another school year, etc. these students remind board office staff why they ‘do what they do’ every year. Their professional assistance was appreciated and their energy wonderful”, said Greta Obermueller.